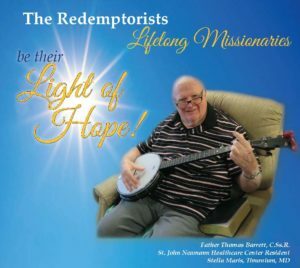 The Redemptorists » Help our elderly Redemptorists: be their light of hope today! Help our elderly Redemptorists: be their light of hope today! A message from Father Thomas Barrett, C.Ss.R. In the early years of my priesthood, the needs of the faithful were great and I was young and filled with enough energy to walk the streets and meet people in their neighborhoods. I found Jesus on the streets and walked with him. I learned so much; I learned to see the needs of the poor; I learned to reach out to people in need of spiritual healing. As I look back, I thank you for helping me to provide help and create hope by the power of prayer. Now I turn to you, to let you know that although I cannot walk the streets anymore, I am now your “champion in prayer.” I hope it helps you to know that someone is praying for your intentions every day. The petitions you send to the Perpetual Help Center in Philadelphia are remembered daily. You allow me to continue my pastoral ministry even though my body is failing me. Thank you! Will you give to help our elderly and infirm confreres in assisted living to receive the care they need? Click to download a pdf explaining how your gift can make a difference! Elderly and Infirm Redemptorists Mission Seminarian Education Where Most Needed Father Tom, please pray for . . . Expiration month: Expiration year: Security code: ? The CSC, or card security code, is a three- or four-digit number that appears only on the card itself—not on statements or receipts—so it provides some assurance that the credit card is in your possession. This helps us reduce fraud. The three-digit card security code appears after the credit-card number on the back of your card. The four-digit card security code is printed above and to the right of the credit-card number on the front of your card.